Last week, a federal court in Montana dismissed a charge against a citizen journalist attempting to observe and document the government roundup of wild buffalo outside Yellowstone National Park. 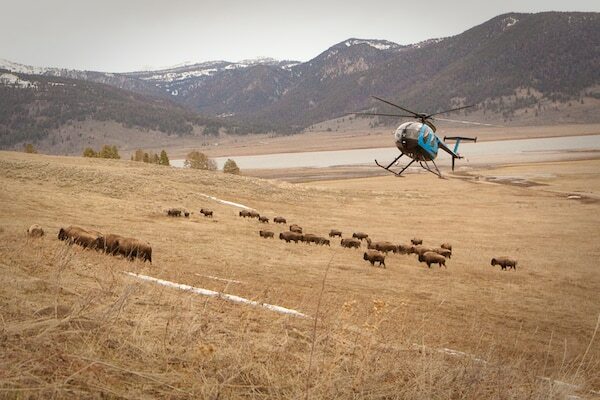 Each year, five federal and state agencies expend $5 million of taxpayer funds to move Yellowstone buffalo from their natural migratory routes back into Yellowstone National Park to make room for privately-owned cattle to graze on the public lands around the Park. Each year, citizen journalists attempt to observe, document, and disseminate to the public information about these government operations. And almost every year, citizen journalists are falsely arrested by law enforcement while doing so. CLDC staff and cooperating attorneys have provided legal trainings and free legal representation for these citizen journalists since 2010. In that time, we have successfully defended 6 individual cases, resulting in the dismissal of all charges in all cases. Each instance involved individuals engaging in protected First Amendment conduct to observe government conduct in public places, and disseminate that information to the public at large. The repeated arrests of individuals engaged in these constitutionally -protected activities strike at the foundation of the First Amendment. The false arrests of these citizen journalists have ranged from arrests for the following alleged offenses: “obstruction” for attempting to document government conduct, “leafleting without a permit” for handing a newsletter to a tourist, and “violating a road closure” even though the road was not closed. These false charges have all been dismissed once they saw the light of a courtroom. However, these charges likely would not have been dismissed without the legal trainings and legal support and representation provided by CLDC staff and cooperating attorneys. This is one of CLDC’s many success stories. At CLDC, we realize how important our work and services are to citizen journalists, activists, organizers, and members of marginalized groups. We are often both the only — and best — option to provide legal services for these groups. So this fall, we are planning to hire two additional staff attorneys who are experienced organizers and have extensively trained with CLDC as law clerks since they started law school, including spending summers helping us in the courtroom, at action camps, and at rural know-your-rights trainings. By doing this, we will triple our staff attorney capacity. We know that by tripling our legal capacity with two more highly trained attorneys, we can expand the reach of our unique and in-demand services to many more communities and individuals in need. Please let us know that you support our expansion by signing up now to be a sustaining CLDC member with an automatic recurring monthly donation. Even if you can only donate $10/month, we really appreciate it and it makes a difference. You can signup to become a sustaining member here. Thank you!